This website recounts facts, not fiction. No names have been changed, and the events are real. This work is copyright protected, and all rights are strictly reserved. Any use of the content or the story line must be approved in advance, and in writing by OwnerManager.org. All rights, privileges, and protections provided by the 1st Amendment of the Constitution to freely express personal opinion are hereby claimed as this literary work and factual publication are just that. 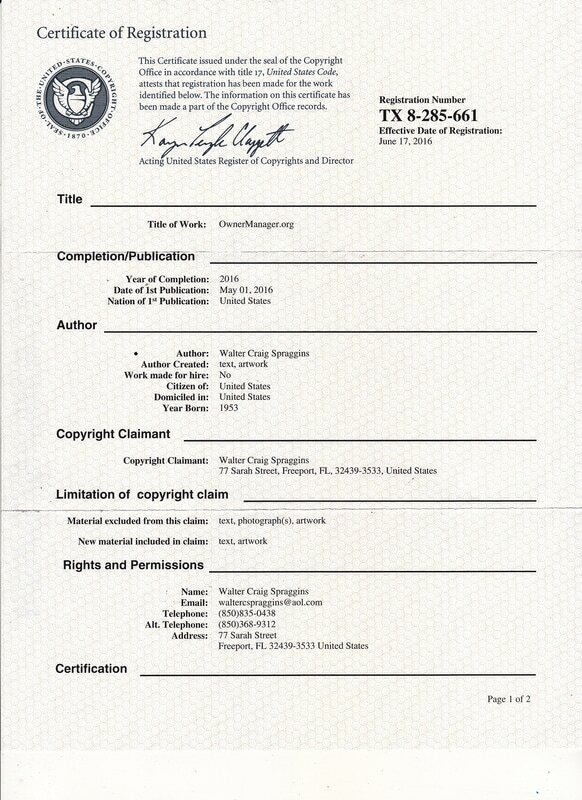 All copyrighted materials used herein are referenced under the “Doctrine of Fair Use” and we encourage each visitor to “Please purchase a copy of each original work so referenced and enjoy it”. This website is a continuing work in progress. Ongoing updates will be made because there is so much to be discussed, decided and published. The best method to contact OwnerManager.org is by using our contact form HERE. This website is provided as a publication of public statistics, public information source, and polling portal, and it is our intent to comply with all applicable American law and regulatory authorities. We assert that “truth” is always subjective, and we admit that facts for one may not be facts for another. You are free, and even encouraged, to test the information found herein, to comment on it, or even correct it by using the Community Voice forums. Your action of continuing to read the content of this website freely acknowledges your acceptance of these limitations, terms, and conditions because you can stop and leave at any time. Thank you for your visit, and we hope you enjoy your journey of discovery. The mark identified above has been published in the Trademark Official Gazette (TMOG) on Apr 11, 2017. On the publication date or shortly thereafter, the applicant should carefully review the information that appears in the TMOG for accuracy. If any information is incorrect due to USPTO error, the applicant should immediately email the requested correction to TMPostPubQuery@uspto.gov. For applicant corrections or amendments after publication, please file a post publication amendment using the form available at http://teasroa.uspto.gov/ppa/. For general information about this notice, please contact the Trademark Assistance Center at 1-800-786-9199. Any party who believes it will be damaged by the registration of the mark may file a notice of opposition (or extension of time therefor) with the Trademark Trial and Appeal Board. If no party files an opposition or extension request within thirty (30) days after the publication date, then eleven (11) weeks after the publication date a certificate of registration should issue. ​&searchType=document Search. NOTE: This notice will only become available on-line the next business day after receipt of this e-mail. 813319 "Other Social Advocacy Organizations" under the North American Industry Classification System. This U.S. industry comprises establishments primarily engaged in social advocacy (except human rights and environmental protection, conservation, and wildlife preservation). Establishments in this industry address issues, such as peace and international understanding; community action (excluding civic organizations); or advancing social causes, such as firearms safety, drunk driving prevention, or drug abuse awareness. These organizations may solicit contributions and offer memberships to support these causes. Providing community action services, such as community action service agencies--are classified in Industry 624190, Other Individual and Family Services. THIS APPLICATION HAS BEEN AMENDED: In accordance with the authorization granted by Spraggins, Walter, C on February 9, 2017, the trademark examining attorney has amended the application as indicated below. Please advise the undersigned immediately of any objections. Otherwise, no response is necessary. TMEP §707. Any amendments to the identification of goods and/or services may clarify or limit the goods and/or services, but may not add to or broaden the scope of the goods and/or services. 37 C.F.R. §2.71(a); see TMEP §§1402.06 et seq. 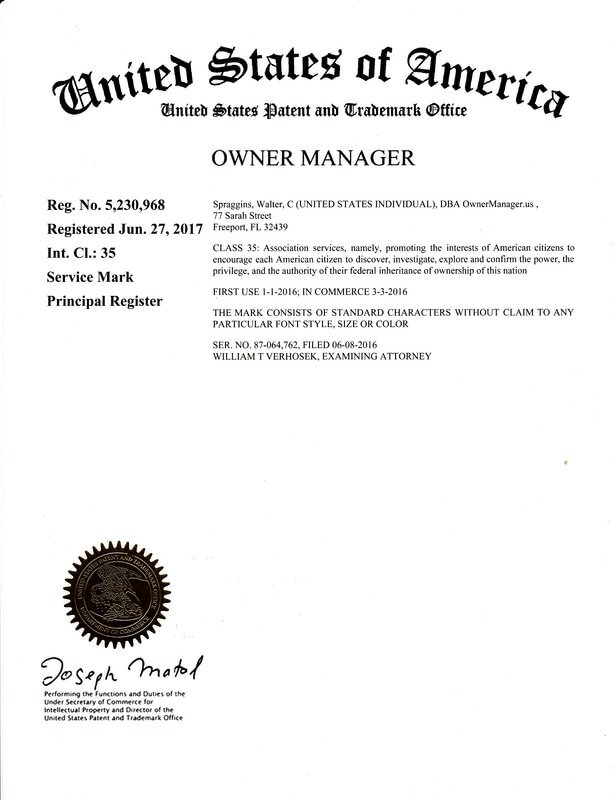 Walter C. Spraggins is a citizen of United States DBA OwnerManager.us. See 37 C.F.R. §2.32(a)(3)(i); TMEP §803.04. TO UPDATE CORRESPONDENCE/E-MAIL ADDRESS: Use the Trademark Electronic Application System (TEAS) form. If you have questions about using any of the materials from our website, please Contact Us thru mailbox@ownermanager.org. If you identify any materials on this website that do not comply with this policy, please contact us and we will take an appropriate action. All sales are final. You may cancel your membership and delivery of services at any time.